Saving a small amount of money now can give you more financial freedom later. Today you might be thinking about attending graduate school, starting your own business, or working toward your next promotion; but you can still look for opportunities to invest in your future. Although retirement may seem a long way off, starting an Individual Retirement Account (IRA) when you are young is a great way to begin your financial journey. Make it automatic. Set up an automatic monthly transfer between your checking account and IRA. You can start with smaller amounts to get in the habit of saving and increase your contributions over time. Contribute refunds and bonuses. If you're getting a tax refund you can have the IRS send your refund to your IRA using direct deposit. Consider doing the same for any bonuses you receive from work. Create a spending plan. Be conscious of your spending habits to help you save money. Consider using budgeting tools, such as My Money Map ™, which is available to Wells Fargo accountholders. When it comes to saving for retirement, time is of the essence. That’s because the sooner you start saving — even if the amounts are small — the more time your money has to potentially grow. This is due to the power of compounding interest. Compounding interest means that not only can your initial investments grow, but the potential interest could earn money as well. Consider the value of a Traditional IRA where you add $1,000 per year beginning at age 23. 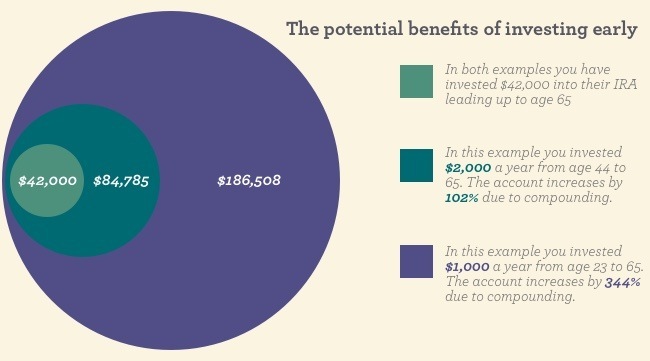 Your total invested funds at age 65 are $42,000, but in an account that earns a hypothetical 6% a year in compound returns, the value would be $186,508. If you waited until age 44 to begin contributing and add $2,000 per year, your total contribution at age 65 is still $42,000, but the value of the account including interest would be less than half: $84,785. The growth of your account has the opportunity to accelerate over time because you are earning 6% on both your original investment and the returns your account earns in the future. And all of that growth would be tax-deferred. This information is hypothetical and assumes an annual return of 6%. It is provided for informational purposes only. It is not intended to represent any specific investment, nor is it indicative of future results. Distributions from a Traditional IRA are subject to ordinary income tax and may be subject to an IRS 10% additional tax if taken prior to age 59 1/2. At any age, saving more money gives you more control over your financial future. Visit the IRA Center to learn more about IRAs, check eligibility, and open an IRA. Build smart habits in your 20s for a lifetime of retirement savings | from: Start early. Contribute often. Seize the opportunity by aggressively contributing to your investment accounts, including IRAs, in your early years before your expenses begin to pile up.